If you violate the rules of the road in Alaska, you may be responsible for paying fines. Often, Alaska traffic fines are the only penalty you will be given for a traffic offense. If you are wondering what typical Alaska fines for some driving offenses are, this guide can help. Keep in mind that most state minimums apply for first-time offenders, and that habitual offenders may be required to pay significantly higher Alaska traffic fines. If you want to find out more about fines in your local area, you should consult directly with your local courthouse by telephone. Many times, the traffic fine schedule may not be fully available online, and a judge's discretion can often increase or decrease your fines. Alaska recently enacted a ban against watching any video device while driving. This ban does not specifically mention texting or cell phones, but has been used as an anti-texting statute by many law enforcement agencies. Alaska makes texting while driving a misdemeanor—not just a civil infraction—which means that you can go to jail in addition to being required to pay Alaska traffic fines of up to $5,000. These maximum penalties are much more likely for habitual offenders. If you have been caught texting while driving for the first time, you may be able to significantly reduce the fine and serve no jail time whatsoever. If you are not wearing your seat belt, you can be pulled over—even if you aren't being pulled over for anything else. The first time you offend, the fine will be only up to $15. Stiffer penalties of up to $50 apply if you have been convicted of transporting a child without using an appropriate booster seat or restraint system. No laws exist in Alaska to restrict children to only the back seat of a moving vehicle, so children are allowed in the front seat of cars without the possibility of incurring Alaska traffic fines, as long as your child is in an appropriate restraint system. 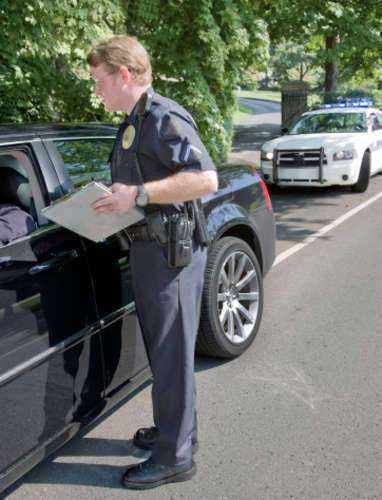 Speeding ticket fines in Alaska vary widely depending on whether you are a first time or habitual offender, where you are caught, and whether you were speeding a dangerous amount. First-time speeders can expect fines of around $100, but that number increases rapidly with every subsequent speeding ticket you receive. Speeding tickets can be aggravated by a number of factors, and if you believe you may be subject to additional penalties besides Alaska traffic fines, you may want to consult with a traffic lawyer. Alaska traffic fines for dangerous speeding may also be combined with reckless driving charges, if you are speeding in a way that endangers others. Drivers on Alaska roads are subject to Alaska traffic fines for speeding even if they were not driving dangerously. You will also be subject to points being added on your license. If the judge agrees, you may be allowed to use traffic school to reduce the number of points on your license.